This digital accessory really brings the digital racing experience alive! Forget the Scalextric Pit Lane Game that has no interaction, this is a fully bidirectional fully linked system that works with the 6 car powerbases to add realism to your racing. 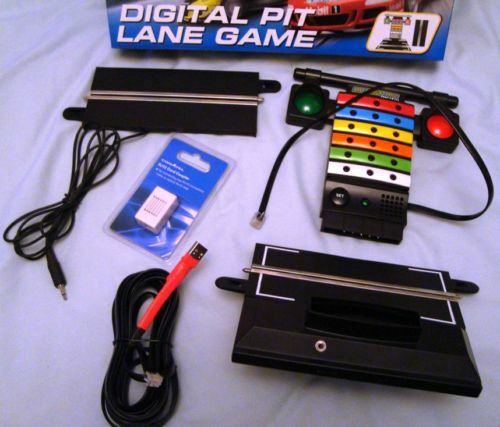 1) A C7041 Scalextric Pit Lane Game, modified to include special Pit-Pro code that produces the necessary data for the PC and interprets signals from the PC to control the lights. It is modified to have an external interface for data out and in. 3) A specialist cable specifically made to interface Scalextric Pit-Pro to a PC, containing TTL to USB conversion electronics integrated into the USB connector shell. Cable is 5m (16 feet) long to get from the track to your PC. 5) A pit straight modified to include an ID sensor to act as the “out” sensor, complete with 2m (6 feet) flying lead and connector. Operation: There are 2 modes – default is PC mode, pressing set button puts system into old pit lane game mode (no sound) PC mode: Display and features are driven entirely by the RMS system on the PC. Typically SSD Console software uses the LEDS to show fuel levels, the red and green lights to show start/stop or flashing both is track-call (power killed for an accident). On start the PC uses the whole of the display panel to draw gigantic calculator style numbers using the LED array for the countdown sequence 5, 4, 3, 2, 1, 0 GO GO GO! The track sensors are used to restrict fuel filling to be within the pit lane and also used to demark the automatic pit lane speed limiter start and finish.